Most of the sodium we consume is in the form of salt, and the vast majority of sodium we consume is in processed and restaurant foods. Too much sodium is bad for your health. It can increase your blood pressure and your risk for a heart attack and stroke. Heart disease and stroke are the leading causes of death in the United States. 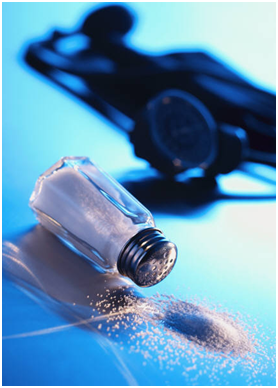 Two new resources are now available on www.cdc.gov/salt. The first is a Tips sheet intended to assist older adults and their caregivers with reducing sodium in the diet both through home cooking and when dining out. The second resource is intended for those providing meals for older adults, such as the Meals on Wheels Program and congregate meal services, and contains resources for reducing sodium in meals served in these settings. The Tips sheet, “Savor the Flavor with Less Sodium” may be found here:http://www.cdc.gov/salt/pdfs/sodium_tips_older_adults.pdf and the “Online Resources for Reducing Sodium in Congregate and Home Delivered Meals,” here:http://www.cdc.gov/salt/pdfs/sodium_resources_older_adults.pdf. Blood pressure management is a key strategy of the Million Hearts Initiative, an effort to prevent 1 million heart attacks and strokes over five years. Colorado participates in this initiative and you can too. Be one in a million - make your commitment and pledge today.